This post is in reference to a list of 30 under 30 released by Forbes India. I am not qualified to comment on the persons included in the list except for one, i.e. Gautam Bhatia, who is a lawyer. He is a known face on Twitter and also a darling of the so-called “liberal” websites. I was actually surprised to see him included in the list. But on doing a little research, I have kind of found a reason. Anyways, let me state at the outset, I have read two of his articles, which he publishes on his blog. In both the articles, the errors committed by him belie his projected high competence as a lawyer. The details are presented herein below in the footnote. Anyone interested in it can read it. However, Gautam Bhatia is just epitomic of the hyperbolization of normal talent by corporate media. As per an article published in Times Now, Forbes’ criteria for this selection are following: “the extent of impact of their achievments, and their ability to disrupt the status quo; scalability of the business or line of work and; their potential to stay a long-term player.” Except for assisting a senior advocate in Aadhar matter and writing blogs, I don’t know any other of his achievements unless getting a degree from Yale is also considered an achievement. Scalability of business or line of work, I think, can’t apply in legal profession for it is neither business nor entrepreneurship, and since he is already assisting a senior advocate in Supreme Court, I wonder how it can be scaled any further up as International Court of Justice is at par with Supreme Court, not over and above it. In legal profession, everybody is a long-term player. In fact, many senior lawyers have fought tiring battles in mofussil courts with high degree of ingenuity but sans any monetary benefits, but they have still not been recognized as senior advocates in any high courts leave aside Supreme Court — I agree not all grey-haired lawyers are deserving of recognition but am sure there are many who deserve much better. Actually, I need not have wasted my time in writing the above for this hyperbolization is extensive in the corporate media. However, I do want to accentuate the fact that the so-called “liberal” websites, who aren’t typically corporate media, have been providing platform to him and many others similarly placed, which is beyond my understanding. For a few days after the Aadhar judgement by Justice Sikri, I was diligently reading various articles written by these junior advocates, who had assisted some senior advocate or the other on both sides of the spectrum. And not one of them was up to the mark. 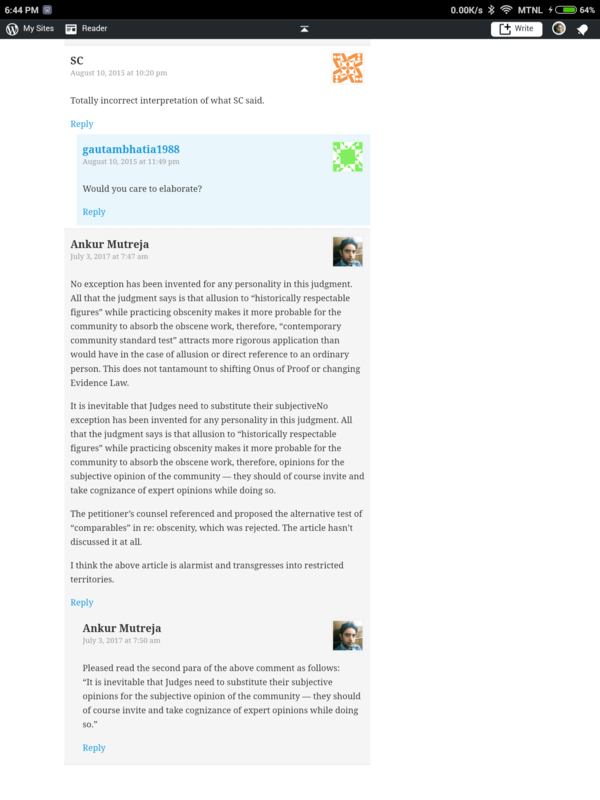 I have discussed one article written by Gautam Bhatia during that period, but I don’t think this is the right forum to discuss others especially when I have not mentioned them by name. However I do think selection of Gautam Bhatia is injustice to similarly placed junior advocates. Btw, I am 40+ but with only eight years of lawyering experience, mostly in litigating personal matters and chamber practice, but, of course, I have appeared in all forums from district courts to Supreme Court and have a fair idea of relative competence of lawyers and the politicking involved in this profession. So, the objective of writing this article is not any professional jealousy. Rather, I am too over qualified for this profession, for I have completed MBA in Finance from a top institute before studying law. My main motivation for studying law was fighting my own cases, from which experience I can authoritatively claim justice is denied by default in our legal system. However, I do have a motivation in writing this article. I want to declare that I am a liberal in true sense, not a Commi/Congressi/AAPian psuedo-liberal, who derive from corporates very much like Sanghis. So, I will “spew venom” on both sides: Sanghis (whom I hate beyond comprehension) as well as pseudo-liberals. Just for record, I have been blocked more by pseudo-liberals than Sanghis for unknown reasons. Having made the declaration thus, I end this post. The following quoted portion from the article entitled The Aadhaar/PAN Judgment: Decoding the “Partial Stay” dt. 12.06.2017 authored by Gautam Bhatia and published on https://indconlawphil.wordpress.com is “manifestly” wrong. The stay granted in the said judgment was merely a stop-gap arrangement purely to avoid hardship to people. No finding wrt cancelling PAN cards, “manifestly unjust” or whatever, was reached in the judgment contrary to what has been stated in the article. You can’t read more than what is stated in the judgment. In another article published on the same website entitled “Historically respectable personalities”: The Supreme Court invents a new exception to free speech dt. 14.05.2015, the author, Gautam Bhatia, has made a bold claim that SC has invented a new exception of “historically respectable personalities” to free speech, suggesting thereby that free speech against figures like Gandhi, Nehru, Padmavati, et al, has been restricted by Supreme Court. I had actually missed the relevant judgment. I accidentally learned of it while reading Rohith Vemula’s notes. He also thought free speech has been so restricted. Then I read the whole judgment and did a Google search where I found this article. I was so surprised that I, for a change, left a comment, which I normally don’t do. The fact is no such exception has been created in the judgment. I am reproducing the screen shot of the comment below. Be the first to comment on "I Will “Spew Venom” on Both Sides"